By the time this county was 100 years old, the area around Brownsville had already seen the great primeval forests reduced to small trees. During the next 100 years, the predominantly Indian population of the area became populated with Scandinavians who cleared the land and began farming. The area changed again from agricultural to small rural home sites and recreational land. Modernization and population growth surrounding this community changed the area more slowly than some of it neighbors. Andrew Nelson occupied a homestead in 1865 just west of Gilberton. His business was dogfish oil for the Port Blakely Mill, catching the fish in what is now called Liberty Bay, Locally referred to as Dogfish Bay. Andrew donated less than one half acre of land for a cemetery (which is now know as the Brownsville Cemetery) in a deed dated October 28, 1903. The land was believed to have been used as early as the 1860’s for burial of Nelson’s relatives, friend and neighbor, both Indian and White. The next homesteader to Nelson was Louis Peterson, one of three cemetery trustees named by Nelson. He raised cattle and oxen for loggers and hay for feed. The first unofficial post office in 1888, was on Peterson’s property on the south side of Brown’s Bay. In 1863 Soloman Brown came to the shores of a very pretty bay surrounded by a dense forest where the stark grandeur of the rugged land appealed to his pioneer spirit. Following the small bay to the mouth of a creek, where the tide, when full, backs up the water for quite a distance between the high banks. He hewed himself out a log house and took up a homestead next to Peterson. In 1890 Andrew Nelson suggested at a public meeting to name the post office Brownsville, after Solomon. Andrew Anderson was the first postmaster and at first the mail was received through the Tracyton post office. It was necessary for the postmaster to make the trip through the woods on foot. This mode of delivery was continued for two years when the little steamer Delta, which was the first steamer to make regular daily landing, started to carry the mail from Seattle. The post office was discontinued in 1912 when a rural route was started from Manette. In later years James Scott, John Meyers, and Angus McIver, all took up homesteads around the little bay which came to be know as Brown’s Bay. In 1884 John Paulson came to the sound and in 1885 filed on a homestead near Brown’s Bay in what is now know as Central Valley. He hauled his lumber from Decatur, now known as Manette. In 1886 Peter Glud took up a homestead where he lived for many years, raising a family. Glud’s corner has become a land mark with a large fish pond below the house. In 1887 Thor Gulbransen homesteaded a place south of Brown’s Bay. Having changed his name to Gilbert, the place became known as Gilberton. Thor hewed out a boat from a cedar log which was used by his daughter to row back and forth to school on Bainbridge Island. Peter Fryberg took up land and started in the logging business in 1884. G.O. Hilstead was another old settler on Brown’s Bay where he raised a large family who have become prominently know throughout the county. After taking up his homestead he bought a piece of land on the side hill near the dock upon which he built a large house where they lived for a number of years. About 1915 W.L. 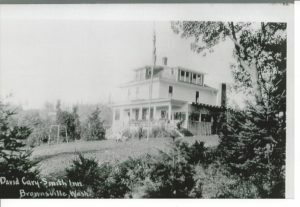 Gassam bought the hillside property and enlarged the house and built 13 cottages calling it the David Carey Smith Inn, after the name of the man who operated it. The Inn was well patronized for several years. On Sundays several steamers would land at the dock at about the same time bringing many guests. Olaf Prim and Andrew Anderson had the first store which they sold to J.P. Hansen in 1893. The store was situated across the bay against the high bank. Peter A. Pedersen in 1903 settled in Brownsville where he bought timbered land and went into the logging business. After the land was cleared he started farming and later went in the dairy business, starting a milk route which he and his sons continued to operate until 1947. His four boys, John, William, Walter and Ralph being mechanically minded started repairing cars on the farm. In 1935 they moved their garage work to a building near the general merchandise store built by M.J. Berg in 1900 where they continued to operate until 1948 when they expanded and built a large modern garage and also erected cold storage lockers. The people of the community built a narrow wooden trestle around the shore to Gilberton. The board walk was low and consequently high tide covered it at times. 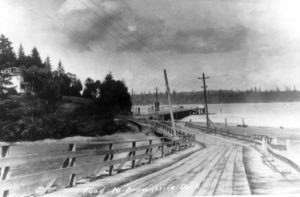 Later the County built a wooden trestle in its place over which cars could drive. This served the purpose until more recent improvements were made to the highway. The first Brownsville School was a small one room log building which was erected in 1894 and located on the William Sutton Road. Mr. Sutton for whom the school was named was the first teacher. The school moved from the log house to an old residence building between 1904 and 1905 near the Brownsville dock. School was held here until the present school building was erected in 1906. 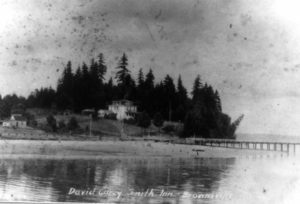 When the trestle over the bay was condemned in 1941 the children were bused to Silverdale. M.J. Berg in 1901 built a saw mill at Brownsville where the mouth of the creek runs into Brown’s Bay. This saw mill operated until 1919 when they dismantled the mill and moved it to Navy Yard City. Axel Anderson built a new store on this highway in 1910. The store changed hands several times over the years. During the years Brownsville has been served by many steam boats such as the Hattie Hansen, Sentinel, Camano, Reliance, Hiyu, Chickaree and Verona. In 1909 Brownsville enjoyed excellent boat service as a steamboat war was on. Joshua Green of the Puget Sound Navigation Company started the war against Gazzam, when he put he steamer Camano on the Brownsville – Colby run, running against Gazzam’s Reliance. Fares dropped form 25 cents to 5 cents. 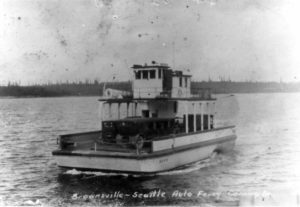 The first passenger service from Brownsville to Bremerton was run by Eugene Laird with the Launch Minnetonka. Later Charles Weberg, from Poulsbo, ran the passenger launch Greyhound. After World War I, business dropped as many Navy Yard workers were laid off. The Grahn brothers bought the Bremerton route form Charles Weberg with Brownsville being the last stop. The Grahn’s maintained this route until December 7, 1941. In 1907 Brownsville’s first Baptist denomination church was built by donation work and material. Sackman Brothers furnished some of the logs which were sawed into lumber The Berg Brothers Mill. The Church flourished for many years until the depression day when it was closed. The Lutherans of Sunnyslope who formed the First Lutheran Church in Port Orchard bought the old building, tore it down and used the lumber to build a new church. Some years later a new church, this time a Methodist church was established in Brownsville, next to the Brownsville School. 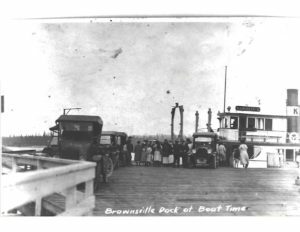 The first Brownsville dock was built in 1901 by community donated work and continued to be kept up by community effort until the Brownsville Port District was formed 7 April 1920 by special election. The first Commissioner’s were E. L. Walker, G. G. Wagner, and E. Ekstedt. The Port of Brownsville has seen many changes over the last 80 years, but it’s goal today remains the same as it was back then, to provide affordable public recreational opportunities and to provide access to the water for safe and responsible use of our marine resources.